Who Will Get A Chance Next Season? 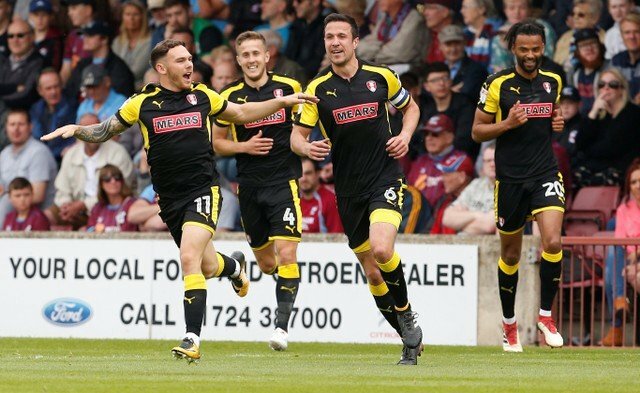 Rotherham United’s First Team Development Coach Matty Hamshaw has told the Official Site that the process of recruiting has been underway for a long time and it is hoped that in the next two or three weeks they will have some players through the door. Hammy also says that the management ‘believe that there are lads here that can play in The Championship’. For one, I’d like to think that most of the squad who helped the Millers get promoted will be given a chance next season in the higher league. After all they were the ones who fought all season, often against the odds, to get to Wembley and now beyond. Most of the lads played together all season and even the ones who were injured were around the playing squad, giving advice and encouragement. I’ve seen on social media some people saying this player and/or that player won’t ‘hack it’ in the Championship. But how do we know? It’s four years since we were there before and that season Rotherham brought in thirteen new players, transferred or released sixteen and loaned in nineteen. It was like a complete new team – a team of players who had to get to know each other, learn how to play with one another. I’d be highly surprised if that happened this coming season. We’ve been told that the players are like a family and I think you can see that by the way they play together. Of course I realise Warney will want to fetch in come new players but he will only fetch in the ones who will add to the family feel, I’m convinced of that. I hope every player who is still with the Millers who played some part in the game at Wembley and the play-offs that got us there get a chance in the Championship. Surely they can expect that much, can’t they?